It’s so hot here, you could fry an egg on the sidewalk. But with the heat index at 106 – it might be a fun experiment! All in the name of science, of course. I’ll let you know how it works out. Today I was just plain tired. But, seeing as moms can never get tired, everyone still expected to be driven to/cooked for/picked up as usual. I needed a snack – something cold, chilled and yellow. But also seeing how the law frowns upon me drinking Cupcake Chardonnay before operating a moving vehicle, I opted to look for something else to fill that sweet, fruity craving. Now, my breakfast was an epic 2 glass smoothie with a whopping 7 different fruits and vegetables in it – so one would think I had enough fruit for one day. Yes? No. I was staring a bowlful of ripe bananas right in the eye – ummm peel? sticker? – and waiting to see who won this staring contest. I did. I am happy to report I am now down 2 ripe bananas. It’s the little things that made me happy today. That’s right, one of those things you see on Pinterest. Only not quite as pretty. Still yummy. Just not anything to stare at for too long. Well, I did. Enjoy Life Chocolate Chips, totally allergen free and well worth it for the taste! coconut, coconut chips, chocolate chips, crushed nuts, sprinkles, anything you want to top them with! 1. Slice your banana into fairly think slices. Pair up into groups of two. 2. Put about 1/4 tsp. of nut butter on 1/2 of the pair of slices. 3. Top with the other slice. You can insert a toothpick into each banana sandwich to make dipping easier. 4. Place on a plastic wrap lined plate and freeze for about 30 minutes, to get them cold-ish. 5. Melt 1/2 cup chocolate chips and add the coconut oil. Stir until blended. 6. Dip each banana sandwich into as much chocolate as you would like. 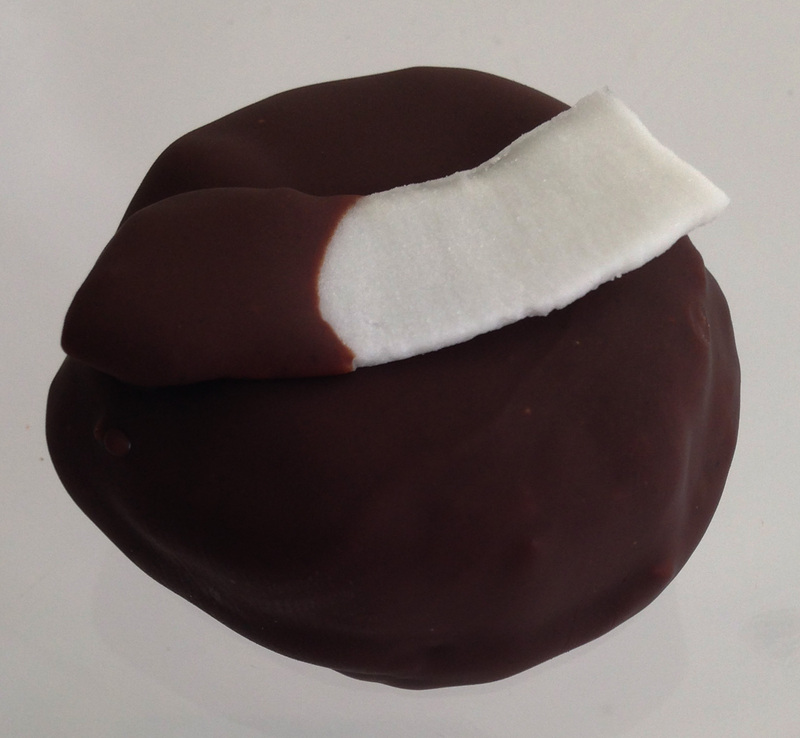 The coconut oil makes the chocolate harden almost immediately on anything cold, so dip quickly! 7. Sprinkle, decorate and top – adding a bit more chocolate as needed to make decorations stick. 8. Freeze for at least 2 hours if you can wait that long! Seriously, a bite to go whenever you need one! 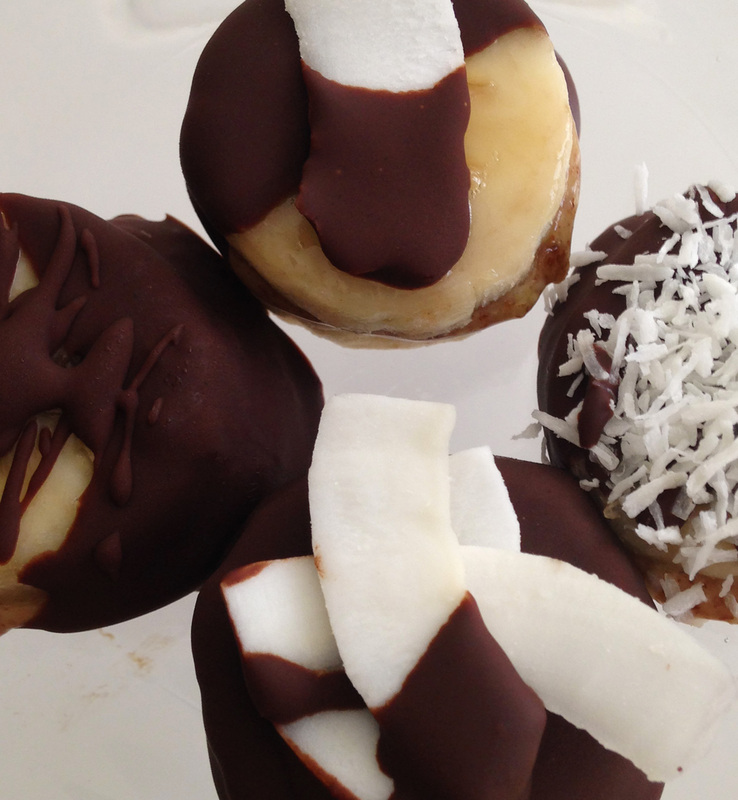 You’ll want to come back tomorrow, trust me……….coconut, chocolate, and coffee…….